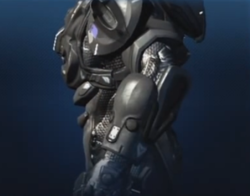 GV-09 Locking is MJOLNIR Powered Assault Armor [GEN2] forearms manufactured by Acheron Security. These forearms improve comfort though modularity. The GV-09 Locking were manufactured by Acheron Security on the planet Mars. SPARTAN-IV supersoldier Newman wore GV-09 Locking forarms. Default unlock: Achieve Spartan Rank 22. Forest unlock: Was a pre-order bonus though Gamestop. It is also available in the Halo 4 Game of the Year Edition. Description: Manufactured on the planet Mars, locking systems improve comfort through modularity.